While the girls were here I wanted to go somewhere on the subway. It’s a great system in Russia which dates back to soviet times I suppose, where you pay once to go in. Once you’re in, you can go anywhere you like for the one admission price. However, once you leave and go out to the streets, you pay again to get back in. None of this zone 1, zone 2 or Miki rip off malarkey. Just pay to get in with a token you buy from a machine. There’s no one asking for your unused ticket as you come out, it’s great! I also knew Alice would like to go on a train. 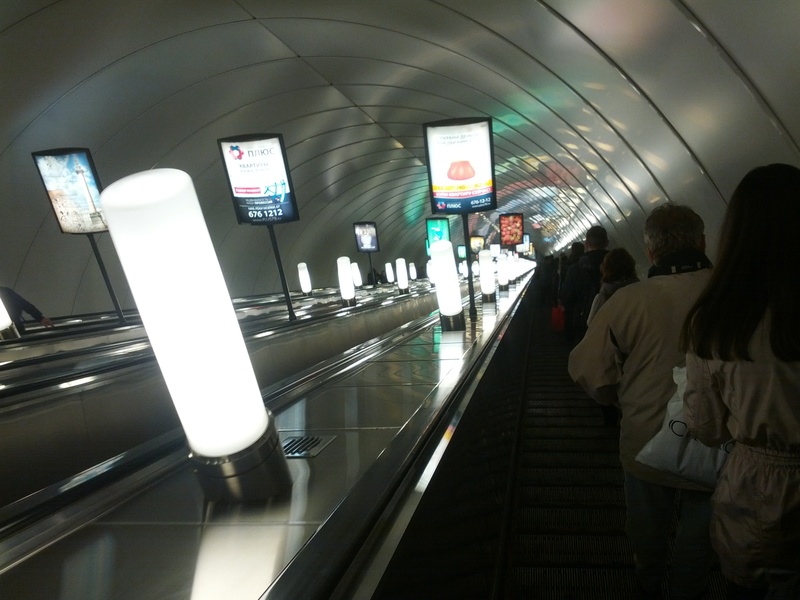 Due to the geography, the metro system in St Petersburg is the deepest in the world, by average station depth. The escalator to go down takes a long time, so long that your mind has time to wander. You come back after whatever daydream you’re having and think ‘oh yea, I’m on an escalator!’. This particular one descends 86 metres!